The Palms Resort Barbados is set on the picturesque sunset coast on the west side of the Island just 30 minutes from the airport boasting an ideal location with an excellent selection of facilities. Silver Point Hotel is a unique boutique style resort offering outstanding service. Its beachfront location allows you to relax in the sun and indulge in the riches of the surrounding waters! Enjoy 7 nights on this colourful and vibrant island with a portfolio of over 100 wrecks the island is just the prefect diving holiday getaway. The Silver Point Hotel is a unique boutique style resort offering outstanding service. Its beachfront location allows you to relax in the sun and indulge in the riches of the surrounding waters! A destination offering an array of wreck and reef dives. Barbados is the perfect destination offering an array of both wreck and reef dives combined with nature, hiking, culture, history and luxury. Barbados is home not only to some exhilarating wrecks but also to some of the heathiest Caribbean reefs. The reefs of Shark Bank, Maycocks Bay and Bell Buoy are well preserved and attract some very welcome creatures including sea turtles, rays, numerous parrotfish and much more. Experience a spectacular world of coral reefs, exotic fish and shipwreck in air-conditioned comfort. Join our captain and crew for a leisurely sail on board our 45ft catamaran. 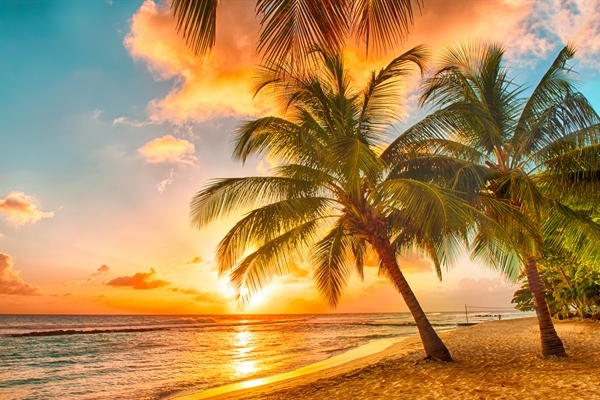 Barbados has long been known for its white sandy beaches, crystal clear blue waters, friendly smiles and, of course, rum! One of its lesser known but by no means lesser quality attractions is its beauty beneath the seas. The island lies in the Atlantic Ocean almost 100 miles east of the Windward Islands; unlike its neighboring Islands which are mostly volcanic, Barbados was built entirely out of coral. Year after year, decade after decade and century after century, coral life and death built Barbados up from the ocean depths. This building process is still continuing and can be witnessed in huge 2 metre barrel sponges, gigantic sea fans, black corals and hundreds of tropical fish that adorn every crack and crevice on its fringing and barrier reefs which circle the island. There are several types of reefs surrounding Barbados, each one unique in its own special way. The barrier reefs, located 1/2 - 2 miles from shore contain large coral heads which form the habitat for thousands of beautiful fish. 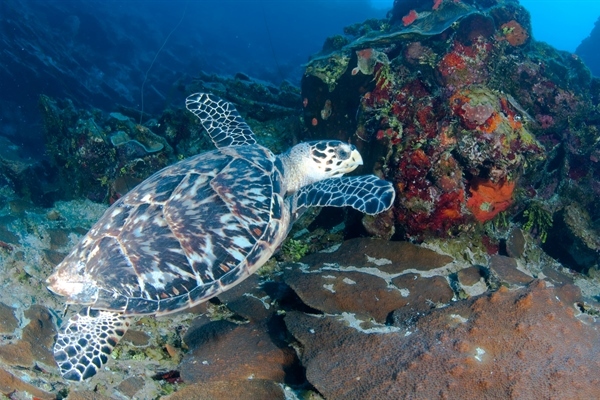 Larger organisms are also found on these reefs, feeding on the smaller fish, you can also encounter hawksbill turtles gliding through the water. Fringes and patching reefs are found closer to shore and have smaller coral formations and more abundant plant life then the barrier reefs. 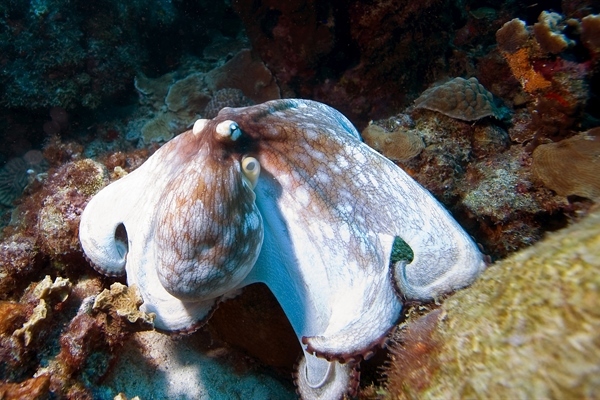 These reefs are home to seahorses, frogfish, giant sand eels and many other marine creatures. Wrecks form fascinating habitats for marine life and Barbados has several excellent sites for wreck diving. Carlisle Bay, with 200 reported wrecks, and the Stavronikita, located at Folkestone Marine Park are two of the most popular sites. 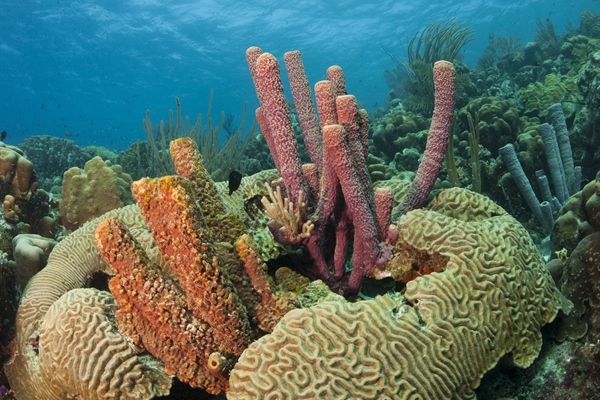 Not only is the island the jewel of the Caribbean, but is also one of the better-kept secrets in the diving community. 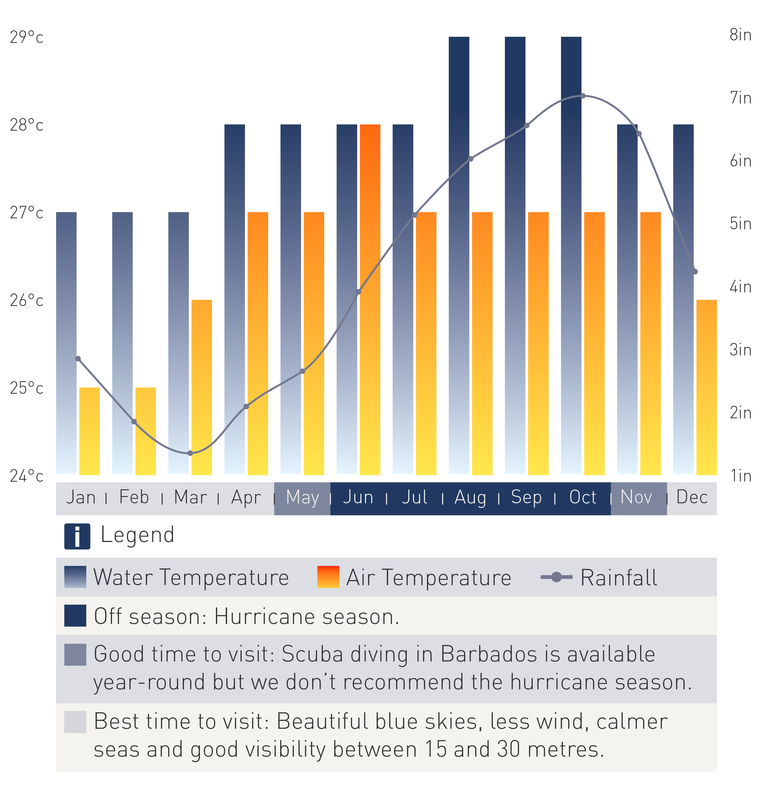 Diving conditions are favourable throughout the year but is best in the summer months and visibility is good. Divers enjoy warm water temperatures year round varying from 29°C (84°F) in the summer months of July-September to 27°C (77°F) in the winter months Jan-March. Typically divers get the luxury of diving in swim suits or skin suits in the summer and may put on a 3mm shorty in the winter. The south coast offers a series of diverse eco systems ranging from gently sloping fringe reefs, to bank reefs and deeper barrier reefs. These reefs are covered with lush soft corrals swaying gently and giving way to a variety of hard corals, sea fans, and sponges the deeper they get. “Highwire” - This reef is between Mount Charlie and Close Encounters. An oval 60 metre long and 10 metre wide has a steep side to 40 metres on its landward side and a gentle slope to 45 metres on the seaward side. Stretched across the reef, 6 metres above the bottom, is an old telecommunications cable now totally enrobed in sparkling sponges like a Christmas decoration. Not to be outdone, sponges on the reef grow like flashy table decorations. Plenty of small creatures can be found good location for photography. You are able to dive this site year round but the sometimes choppy sea conditions mean that this can be done as a drift dive. You may encounter Queen angelfish, mackerels and snapper whilst exploring the reef. “Caribee”- Beautiful barrier reefs and amazing drop offs, are not the only thing Caribee has to offer. This reef is part of one beautiful reef system that has been broken up into three parts. 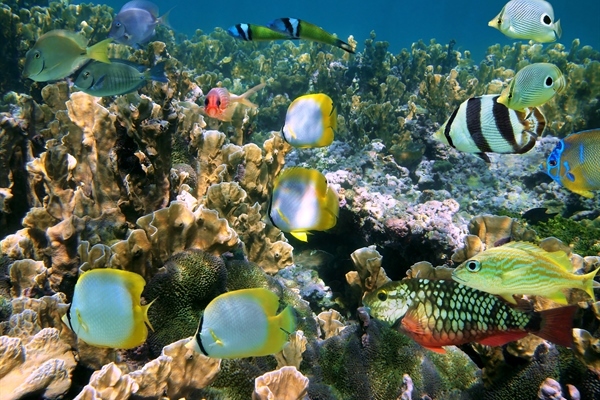 It’s covered in corals and abundant marine life. Due to mil d currents, this site is recommended for intermediate level divers, although beginner divers can also diver here, subjected to diving in groups or with experienced divers. 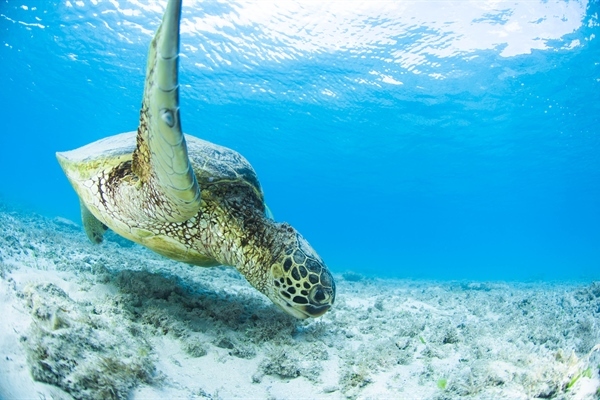 You can see barracuda, eagle rays and turtles at this dive site. The west coast offers calm and tranquil marine environments of beautiful hard coral formations, shelving coral with sea fans, and large sponges protruding from the reefs. It's also the home of two dazzling shipwrecks the Stavronikita, and Pamir. “SS Stavronikita” – This 110 metre long Greek Freighter is upright in the water; it is considered to be an advanced dive due to the depth. The stern is at 40 metres and the bow at 21 metres with the deck at about 24 metres. 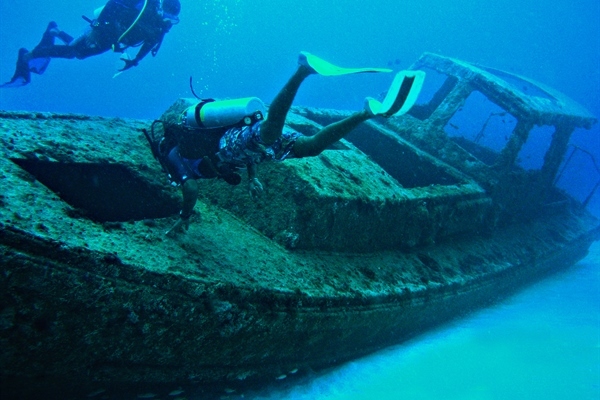 After being sunk on November 22 1978 as an artificial reef, the Stavronikita has become a popular dive site in Barbados. She has lots of marine life and years of marine growth. Her propeller is very common among divers (even at 40 metres). The "Stav" as it is commonly known starts at 6 metres at the top of the fore mast which itself is covered with different corals and lots of sergeant majors. As you go down the mast you encounter groupers and snappers around the bottom of the mast. The wreck is well intact even though she has been down since 1978. This wreck can be dived in two ways, from the propeller up through the ship with a maximum depth of 40 metres, or along the deck and though the cabins with a maximum depth of 30 metres. Lots of sponges and black coral have grown on her. You can find lots of sea whips by the propeller. There is easy access to the interior through cut out areas, the huge forward and aft cargo holds, and the cabins, stairways and engine rooms can be penetrated. This dive is rated as one of the best wreck dives in the Caribbean. It is a great dive for avid photographers. Resident barracudas, eels & snappers lurk in the shadows so keep an eye out. The north and east coast offers adventurous diving, but due to the roughness of the Atlantic sea, diving is seasonal. These different eco systems are what make it so appealing and accommodating to all levels of scuba divers. “Maycocks Reef” - an exceptional reef located on the north of the island, separated by corridors of white sand approximately 15-30 metres apart. Fish life is outstanding and includes large rays, barracuda, parrotfish, schools of Bermuda chub, creole wrasse and triggerfish, not to mention excellent coral and barrel sponges. 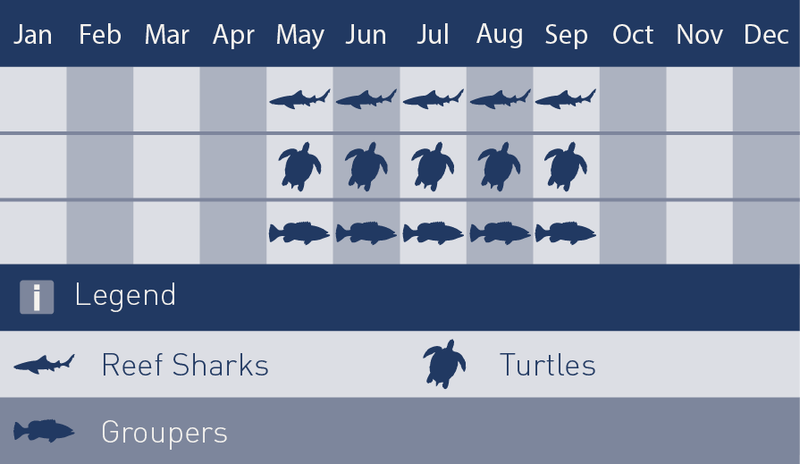 Here is where you might see nurse sharks, large adult turtles and seahorses. An absolute favourite for locals and visitors, not to be missed. “Pamir” - this wreck, located to the north of the island is 165ft long and 60 ft deep and offers a relaxing dive - perfect for beginners! The average visibility is 10-20 metres and access to the dive site is by boat. The Pamir is a photographer’s dream. She is a 65m freighter and was sunk in 1985. The hull lies in 15m depth and the bow in 12m. It is possible to descend into the cargo hold and swim through to the front portion of the boat. The combination of several years beneath the sea and lying at a shallow depth has resulted in the wreck being covered in colourful sponges and corals. There is a lot of fish life too including soldierfish, grunts, gurnards and sergeant majors. If you look very closely you can see tiny little holes in the coral growth over the surfaces of the wreck and inside those tunnel-like holes live gobies. These shy little creatures play a fun game of hide and seek with divers and frustrate photographers. The Pamir lies on a sand patch in the reef. 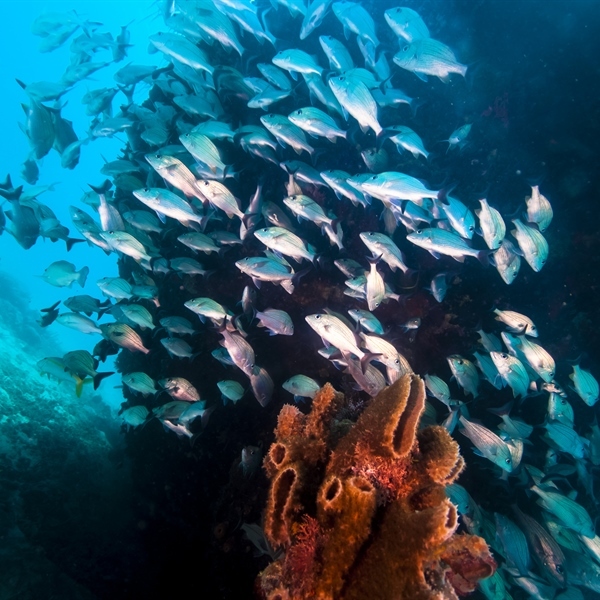 Sand eels can be seen in the sand around the wreck and squid and large crabs have been seen in the surrounding reef; so by all means dive the wreck, but don’t turn your back on the nearby reef. “Consett Bay to Bathsheba” - On the Atlantic side of the island, there are about 10 different sites available depending on the weather conditions as seas are usually rough. Best times are in the summer months. Plenty of big fish including sharks can be seen here. “Carlisle Bay” - The Carlisle Bay Marine Park with its 6 shipwrecks in close proximity is an excellent site for divers of all levels of experience, from novice to expert. Carlisle Bay, on the border of the south and west coasts is a natural harbour and generations of sailors long ago threw empty rum, whiskey and medicine bottles over board. These antique bottles can be hunted and collected along with cannons, cannon balls and large anchors which are frequently found in Carlisle Bay. Of course what would a tropical paradise be without shipwrecks? Again, Carlisle Bay is host to unique wrecks, the Berwyn, Fox and Ctrek along with the Bajan Queen, the Eillon and the bow section of the Cornwallace which was cut off and replaced after she was hit by a torpedo during the Second World War. These wrecks, lying in 8-12 metres of water are all close enough to visit during the same dive. The great diversity of brilliantly coloured marine life including frogfish, seahorses, rays, barracudas, octopus, reef squid, mackerel, moray eel and batfish are also found at this site. 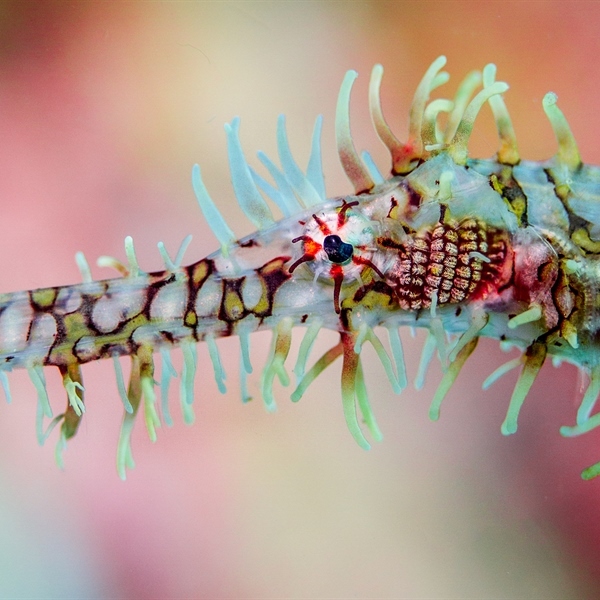 This dive is a macro photographer's dream! There are no specific vaccinations required for visitors travelling to Barbados; you should be up to date on routine immunizations. Your personal physician may recommend preventative measures. Commonly recommended vaccinations are for Hepatitis A (for all travellers) and Hepatitis B (for long-term visitors) Yellow fever vaccination certificates are required for travellers, over one year of age, travelling from infected areas. A service charge of between 10 and 15 % is typically added to your bill at hotels and restaurants. Once this appears on your bill, any additional tipping is at your discretion and should reflect the quality of service you received. 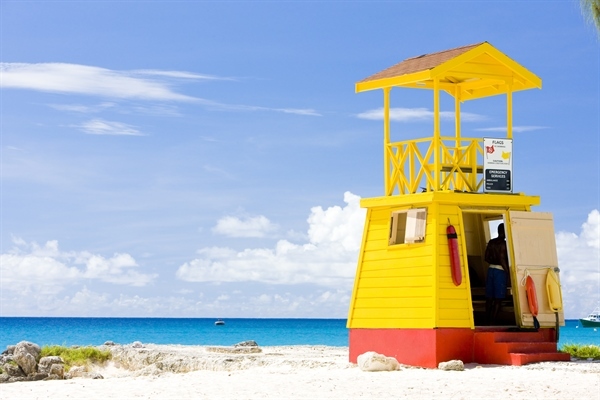 British passport holders don't need a visa to enter Barbados. On entry, you will normally be granted a specified period to stay. Your passport should be valid for the proposed duration of your stay plus 6 months after the return date. Direct flights from London with BA and Virgin Atlantic on selected days of the week. The average flight time is 9 hours from the UK on a direct flight. Our packages include transfers on arrival and departure day. On arrival you will be met by one of our representatives and transferred to your resort. 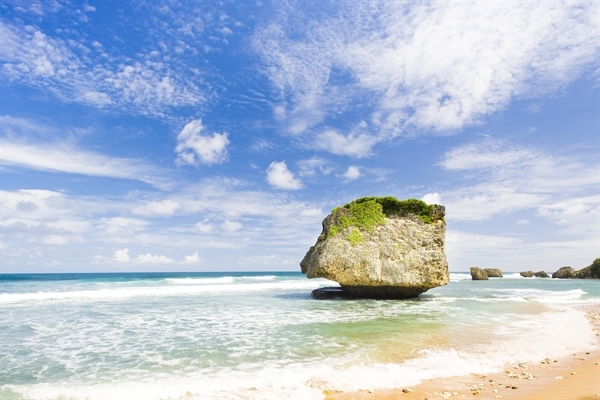 Barbados is ideal for scuba diving year round. Visibility ranges from 12 to 21 metres. The reefs boast sponges, coral and plant life, while the many wrecks provide a habitat for a wide variety of marine life. This promotion is not combinable with any other offer or promotion.